An evening revelry calls for a central space. While in your younger years you may have gathered friends around your parents’ den or basement, now that you own your own home you can upgrade a stylish yet practical outdoor bar set to set the tone for a fun night of socializing. Bar sets are a unique outdoor home furniture choice — the elevated seating creates a sanctioned space for whatever the evening has in store, whether it’s merely chatting and swapping stories or plunging into hours of your favorite card game. The benefits of an outdoor bar set are clear: they provide a seamless way of blending the comfort of an indoor seating area with the pleasures of immersing in the great outdoors. But buying an outdoor bar set is easier said than done. There are a host of factors to consider, from the amount of space you have to work with to the type of material you should go with for your purchase. Don’t get bogged down in the details — we’ve sorted through the major questions you should consider below to make the decision-making process straightforward. 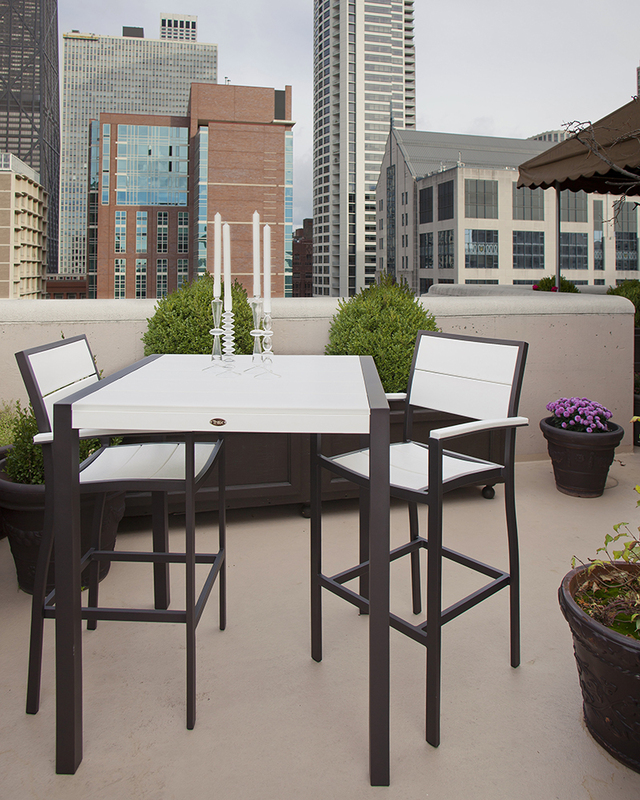 A distinct advantage of an outdoor bar set when compared to an option like a dining set is the compact nature of the design — bar sets are vertical instead of horizontal, so you can theoretically fit more people into your social space while using less square footage for your entire set. If you have a snug balcony or a patio extending along the side of your home, a bar set is a terrific option. About how much space will you need to fit an outdoor bar set on your porch or inside your deck? The answer depends on how many people you plan to entertain in your space. While dining sets can fit larger groups, with sets ranging from 5-pieces to 9-pieces depending on the brand, outdoor bar sets are more intimate. Typically you will be choosing between 3-piece bar sets for two people or 5-piece bar sets for four. However, if your bar set is intended as a gathering space for cocktails and conversation one or two additional people can easily stand around your bar table if it acts as one zone of a larger patio. So ask yourself — is this bar set for me and my sweetie to have breakfast during the sunrise? Or is this a place I intend to play cards and catch-up with friends through the night? Let’s look at our Cape Cod 3-Piece Bar Set and the complementary Cape Cod 5-Piece Bar Set for a size comparison. 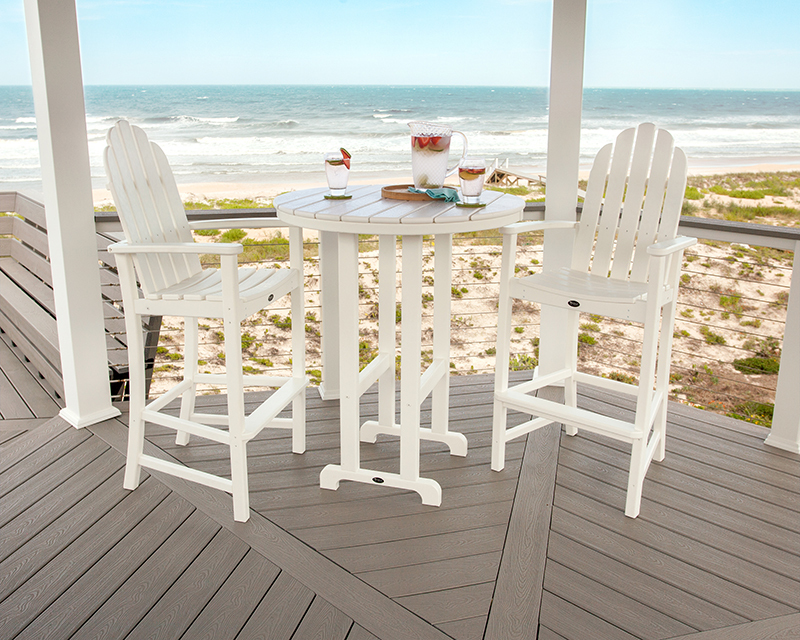 The Cape Cod 3-Piece Bar Set comes with two Cape Cod Adirondack Bar Chairs and a Round Monterey Bay 36” Bar Table. The set measures about 104” wide and about 60” deep total when placed on your deck. 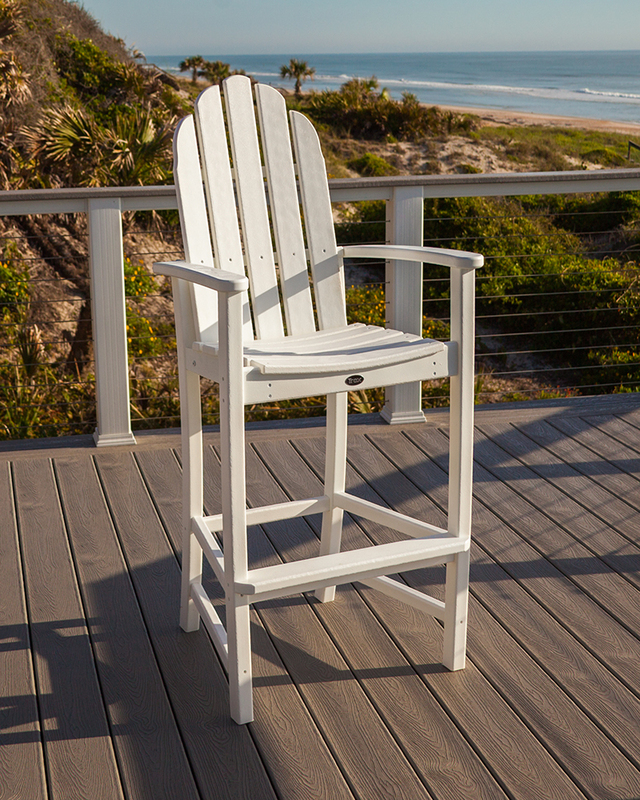 With the addition of two Cape Cod Adirondack Bar Chairs the 5-Piece Bar Set measures about 117” in both width and depth. Keep in mind that you should allow at least three feet of space in every direction around your bar set to allow easy in-and-out access. The primary difference between bar, dining, and counter sets is seat height. A bar set features the highest seat height of any outdoor social or dining set, with our bar chairs measuring around 30” in height. This creates an elevated space that is conducive to intimate conversations. Bar chairs are higher, so you can’t slide in and out as easily as you could with a dining chair or counter chair. These sets are intended for group gatherings where you won’t be getting up and down as often to serve yourself. Drinks, appetizers, games, and desserts all mesh well with the additional height and privacy that a bar set provides. If you plan on mixing and matching bar chairs and bar tables keep in mind that you need about 10 to 13 inches of space between the top of the bar seat and the underside of the table. 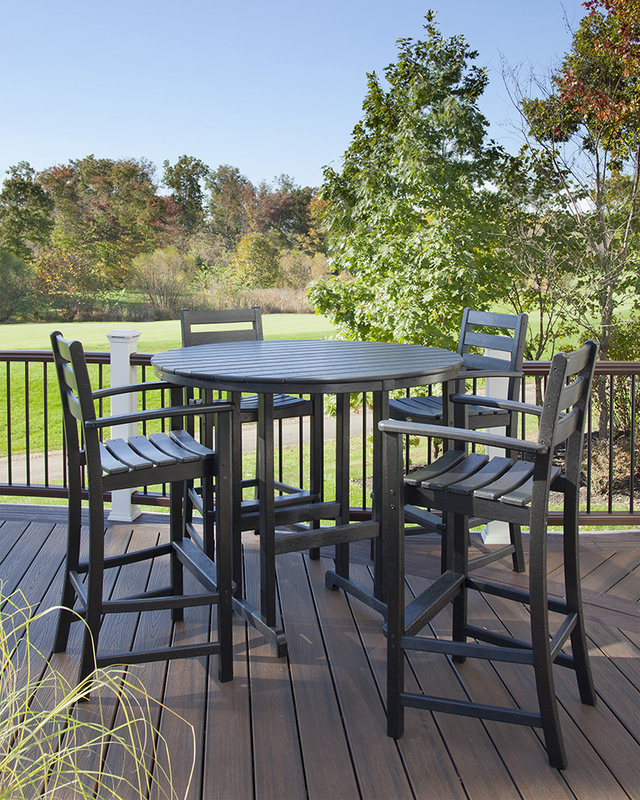 When you purchase a bar set through Trex® Outdoor Furniture™ you can be confident that our bar chairs and tables are coordinated for optimal spacing. Ideally, the materials you choose for an outdoor bar set will be weather resistant and held together with marine grade hardware that can withstand years of exposure to the elements without cracking, chipping, rotting, or rusting. Of course, depending on your budget and where you would like to place a bar set there are multiple material options that can get the job done. Softwoods are often the cheapest option, and this reduction in price is evident in the wear and tear that will quickly accumulate. Expect scratches, dents, and water damage after a full year of seasonal weather. Softwoods require consistent staining to prolong their lifespan, but will typically only last a few years. Hardwoods like oak will last much longer than softwoods. Still, you will encounter some issues if you buy a hardwood bar set. Hardwoods must be regularly varnished and protected if they are to remain outside. Because hardwoods are moderately expensive you will notice they are more durable and resilient, and are damaged less easily than softwoods. An advantage of teak right out the gate is the wood’s ability to produce its own oil, so varnishing and staining are not required. This popular wood choice can remain outside year-round and is pretty tough when pitted against the elements. It is only available in one “color,” teak. Teak must be treated and cleaned often to avoid the inevitable “silver patina” look. Wicker is very affordable but should be avoided for outdoor use, as it is very light and therefore vulnerable to wind gusts. Wicker will degrade quickly if left outside during rain, storms, or even cold weather. Wicker is difficult to clean, but its low price makes it appealing for sunrooms and other locations where weather is not a factor. High-density polyethylene (HDPE) lumber is an extremely durable plastic used to craft furniture designed to last a lifetime. HDPE is a medium weight material yet it’s extremely resilient against all types of weather, including wind, rain, snow, and long-term sun exposure. This sturdy lumber is available in a wide variety of colors and is recyclable. The high quality of HDPE lumber is evident in its higher price. At Trex Outdoor Furniture we stock outdoor bar sets that are crafted with genuine POLYWOOD® HDPE lumber and some with a combination of aluminum and POLYWOOD lumber. Each of our products is backed by a 20-year residential warranty so you can rest assured your furniture will weather the elements year after year. Once you decide to invest in top-notch bar sets you still have to decide what style and size is appropriate for your home. 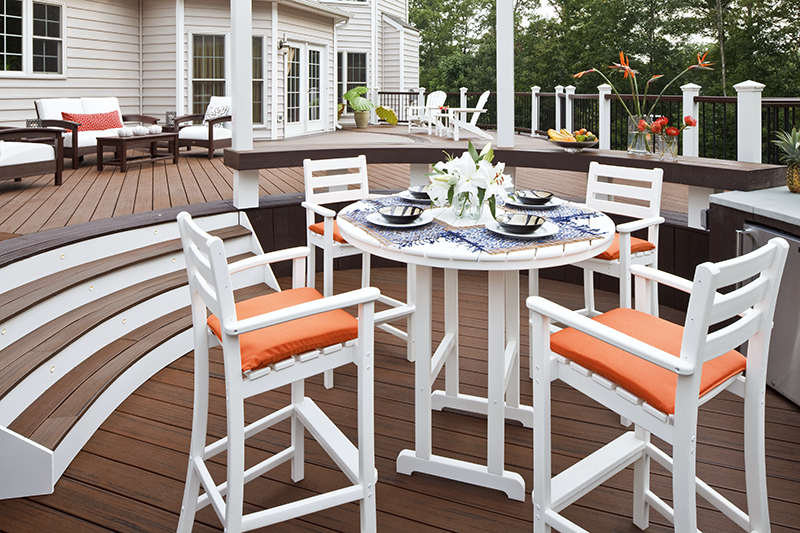 Featuring a relaxing and classic East Coast Adirondack design, the Cape Cod 3-Piece Bar Set slides into smaller spaces like a porch or balcony to provide a romantic setting or a comfortable nook. The contoured slatted design equally supports your back and your legs so you can settle in comfortably for the evening and the 36” table provides just enough space for two. 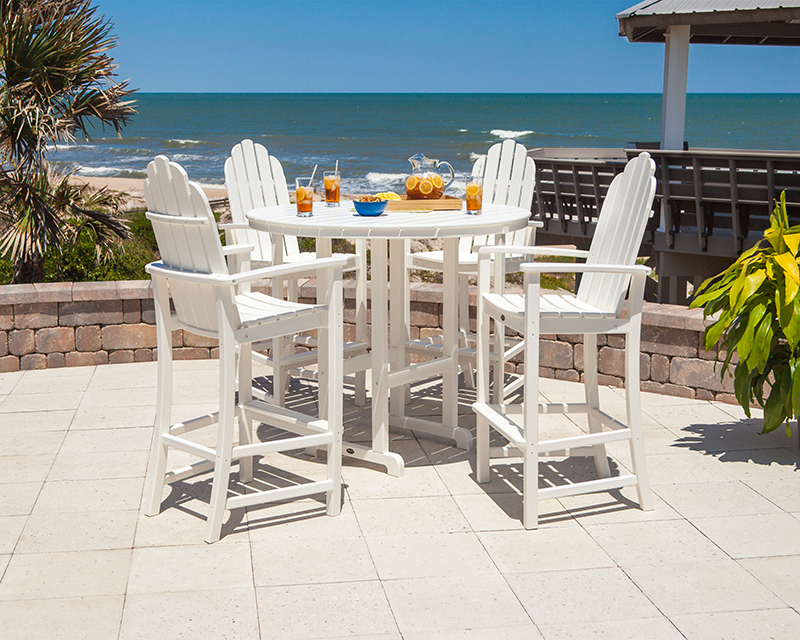 With seating for four in Adirondack Cape Cod Bar Chairs, the Cape Cod 5-Piece Bat Set allows space for guests to gather. Ideal for spacious decks or poolside patios this bar set mirrors the design style of the 3-Piece set above but features a larger 48” table. If you’re looking for clean lines and modern flair you can’t go wrong with the sophisticated and comfortable Surf City 3-Piece Bar Set. The distinctive style combines powder-coated aluminum frames with HDPE lumber slats for a wholly original take on the cozy bar set. With 3 pieces this set is best suited for a couple or an additional tabletop space for occasional entertaining. This inviting bar set inspired by the laid-back elegance of the homes along California’s salt-soaked coastline can transform any spontaneous happy hour into a night of fun. Clean, classic lines make the Monterey Bay 5-Piece Bar Set visually appealing in a wide variety of architectural styles. Any space with enough room is a prime location for this versatile bar set. 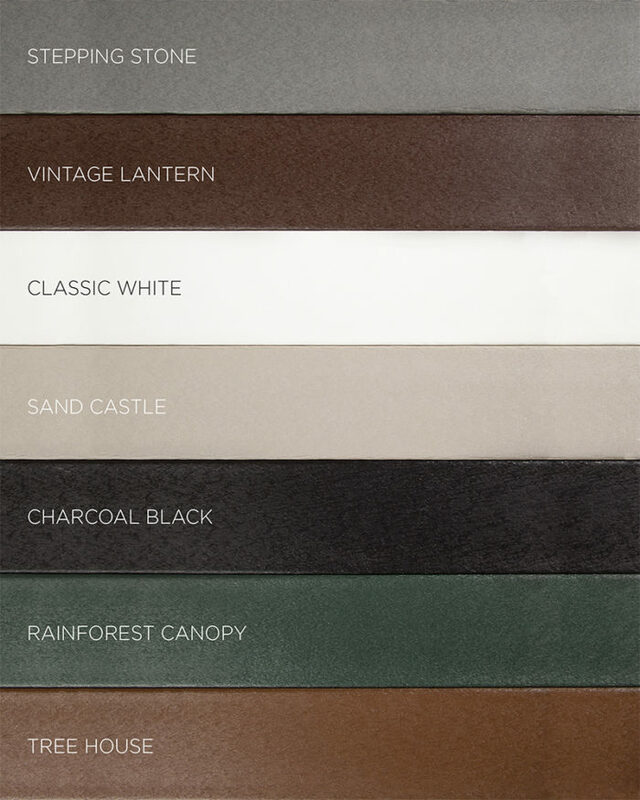 If you decide to order an outdoor bar set from Trex Outdoor Furniture you’ll have the choice of a variety of rich earth-tones and neutral hues to highlight your home’s exterior design features to bring out the best of any space. An outdoor bar set creates the perfect setting for a casual hangout or a semi-formal soiree in the comfort of your own backyard. Shop today for a timeless, functional, and stylish bar set ready for years of outdoor use.